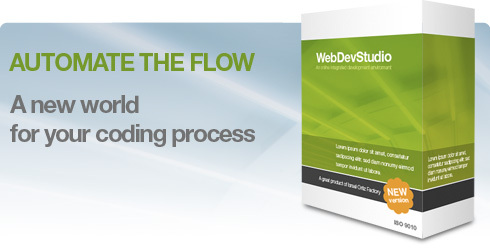 WebDevStudio is an online integrated development environment (IDE) based on AJAX/PHP technology. Any software developer would be able to design computer science projects with or without of greater or smaller complexity, using only a Web navigator and without worrying about file and project management (creation, modification, compilation, etc.). Tool would be completely in charge of the projects and registered users. From server machine, it would be provided to developers a set of operations integrated in a powerful graphic interface without having installed in client machine any development component (compiler, code editor, etc). WebDevStudio integrates a simple resource manager whose basic undertaken will consist of maintaining always consistency between server and client machine. User management controls users which are registered and who would have access granted to the tool. Project management controls projects created by users and allows to build them and make backup copies. File management controls files which owns to each project, and they can be downloaded, modified and compiled at any moment.